Okay, I've heard the hype, but I still haven't tried Pinkberry or Tutti Frutti. Yet now, after discovering a wonderful little place on Telegraph Road, I'm pretty sure I don't need to. Open for six months now, Wild Cherry Frozen Yogurt is a true find, and given that it is in walking distance of my house, I am beyond thrilled. What drew me in is the huge banner hanging on the storefront that reads: "33 cents per ounce." I don't know how many ounces are in a regular cup of ice cream or yogurt, but this had to be more affordable than the $12 I spent the last time I went to Ben & Jerry's with my children. Tucked into an unassuming strip mall, Wild Cherry is a neat little spot- decorated in bright colors and filled with modern metal tables and funky brightly colored plastic chairs. The yogurt is self-serve, so after reading the instructions (choose cup, fill with yogurt, add toppings, pay) we tried to choose from the variety of yummy options. Fat-free vanilla, fat-free chocolate, tangy yogurt, green tea, strawberry, mango, fat-free cheesecake, and peanut butter were among the offerings. My five year-old chose peanut butter and topped his with mini m&ms and my three year-old chose strawberry topped with marshmallows. Believe me, spooning on their own toppings may very well have been the highlight of their day. I, too, was in heaven since I was able to serve myself lots of little tastes in my cup - caffe mocha, cheesecake, and peanut butter because I simply could not resist. All of the flavors were wonderful - the strawberry had the perfect tang of the berry flavor coupled with a nice subtle kick of true yogurt flavor. The peanut butter tasted just like creamy peanut butter ice cream, and the caffe mocha reminded me of Starbucks. And as I sat there savoring every bite, I couldn't believe how cheap (and I mean that in a good way) this fun little outing was. After weighing all three yogurt cups, our total came to $4.89! This is a great destination if you're looking for a healthy yet affordable treat for your kids that tastes more than decadent. 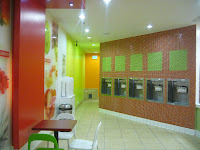 Tutti Frutti and Wild Cherry have delicious frozen yogurt and a fun atmosphere. The yogurt is self-serve, and when I took my kids, I made the mistake of letting them serve their own yogurt - and they only give you one size cup: HUGE! By the time they filled their cups with yogurt and added toppings, they weighed a ton, and because you pay by the ounce, it cost a fortune! I know one mom who took the yogurt home because the kids got too much, and they ate it every day for a week! In the future, I will do the serving and maybe sneak in my own toppings in zip-lock bags!